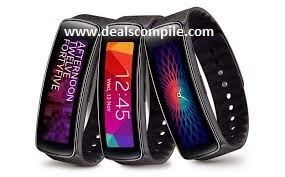 -Interchangeable bands of Samsung Gear Fit . -Gear Fit allows you to easily control the Heart Rate -Sensor and many more features. Connected Notification Samsung Gear Fit equips you with instant notifications of emails, SMS, incoming calls, & 3rd party apps to keep you connected. Dust and water resistant protection (IP67).